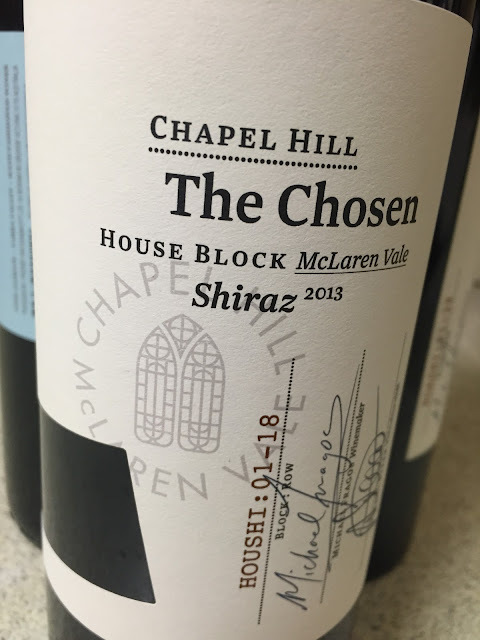 While the Chapel Hill wines are typically good quality and always well made, they don’t really get exciting until we hit this ‘Chosen Series’ range. This duo really kicks goals too. Makes you feel like you’re on the ridge near the Chapel Hill cellar door, rows of vines spreading away around you, the Onkaparinga Gorge one way, the ocean the other. Hello McLaren Vale. Anyway, what makes this special is about differences. Two McLaren Vale Shiraz, made in an almost identical fashion, from the same maker, separated just by where the grapes for each wine were grown. Same same but different. Terroir in action. I tasted these two blind actually, just because I wanted to remove the usual prejudices (I normally prefer the House Block). Variety is the spice of life after all. I’ve included extra background bits in italics. Planted 1977. Own roots and heritage clone. 08ha block. Elev: 164m. Well drained north facing slope. Brown sandy loam with Quartz over sandstone. 14.7%, Screwcap, $65. Planted 1993. Own roots and 1654 clone. 1.82ha. Elev: 165m. Gentle North East slope. 40cm of pebbly light brown sandy loam over orange to yellow clay interspersed with ironstone over solid sandstone. 14.7%, Screwcap, $65.